It was a big day for a general on Capitol Hill yesterday, as Gen. David Petraeus made his long-awaited “progress report” to a joint House committee. But one congressman remembered the last time a general’s testimony drew such public attention. It was on April 1967 that Gen. William Westmoreland made his speech to Congress about how much progress we were making in Vietnam. Later, in November 1967, the general spoke to the National Press Club saying, “With 1968, a new phase is starting … we have reached an important point where the end begins to come into view.” It was in that speech where we heard the historic phrase about the “light at the end of the tunnel.” Then, January 1968 saw the Tet Offensive and the beginning of the painful end of Vietnam. U.S. deaths in the war from 1956 to 1967 totaled 19,560. But after 1968, there were 38,633 more (including those who died from wounds after the war ended with the ignominious departure of U.S. troops in 1973). More than twice as many of the names on the black wall that is the Vietnam Veterans Memorial came after it had become clear that the war strategy had failed. President Bush said the “surge” was to create “breathing space” for political reconciliation among Iraq’s warring factions. And that has clearly not happened, despite the reports of mild security improvements in some areas. In fact, on Sunday’s Meet the Press, Gen. Jones said the opposite was true — that real security in Iraq was not possible without political reconciliation. And because there has been no political reconciliation because of the surge, it is so far a policy failure. Despite the surge, sectarian violence still reigns in Iraq, young Americans remain caught in the crosshairs of a civil war, and the bloody insurgency/counter-insurgency continues the kill each week. But the general with four stars on his shoulders and a chest full of medals says we should soldier on, which is what we all knew the president had already decided to do. When was the last time you saw a general saying he was losing a war? Where there has been real progress on security, like in Anbar province, it is because of tribal leaders (other Muslims) getting tired of the religious extremism of al Qaeda terrorists — it is not because of the surge. In addition, because the area is virtually all Sunni, the promise of Sunni/Shiite reconciliation is low. But in the undermining of support for Islamic radicalism among other Sunni Muslims, there are clearly lessons to learn about strategy — but more than military strategies. Yet the Bush administration still refuses to learn any lessons from the 9/11 anniversary other than military responses and, indeed with Iraq, in a misguided and disastrous military response. Iraq was not the central theater of the “war on terrorism” until the U.S. intervention turned it into a terrorist training camp and recruiting ground for a new generation of suicide bombers. The Iraq debacle reveals military solutions to be among the least effective in the battle against terrorism. Bin Laden’s latest video reminds us that he is still out there. Does anybody really think we are safer than we were before 9/11 or that Iraq has made us more secure? And the Bush administration has not even begun to learn the biggest lesson of 9/11 — that unilateral strategies are the most ineffective response to the real threats of global terrorism. But the new and creative multilateral strategies we most need to undermine and defeat religious extremism and political terrorism are blocked from emerging in the kind of unipolar world that the U.S. still wants to dominate. For example, any serious opponent of the war in Iraq knows that having so disastrously intervened, the U.S. is indeed responsible for stabilizing and rebuilding Iraq in ways that protect against the potential post-war bloodletting that the White House continually warns us about. But how we best do that is the critical question. A real argument for international involvement and multilateral solutions can be made for that very task, one that includes a primary focus on regional diplomacy to prevent more destabilization in the Middle East. But it is, in fact, the continued U.S. occupation that most obstructs the possible international interventions that could save Iraq and the region. In the meantime, it is the human cost of the continuing war that is most painful. Every week more Americans will die, along with an untold number of Iraqis. 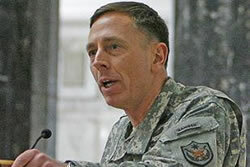 And there is no end to the killing in sight with President Bush’s intransigence and Gen. Petraeus’ promises. After today’s testimonies on Capitol Hill, it’s clear that the next war is already being prepared — a war with Iran. A state of permanent warfare is now the U.S. strategy for defeating terrorism, which will only make it worse. John McCain keeps talking about “honor” and hopes the surge will help his wilting presidential campaign to surge again. But there is no honor in a war that was fought on false pretenses, that sends young Americans on hopeless missions only to die, that slaughters the innocents in even greater numbers and doesn’t even bother to count the dead, and learns nothing from its mistake of relying on military solutions instead of political ones. Because George Bush now compares Iraq to Vietnam, I will too. The endless killing of my generation in Vietnam was justified by one changing rationale after another, but the last justification for continuing the killing was reduced to “bringing our boys home with their heads high.” We’re hearing that again now in talk about “winning” and “credibility” and “honor.” Well, the Vietnam boys came home with their heads disillusioned, their bodies broken, and their hearts sickened. We probably won’t end this strategy of destruction and defeat until fathers (like me) and mothers decide that their sons and daughters won’t participate in it anymore. So last night, I talked to my 9- and 4-year-old sons and told them I never want them to fight in America’s misbegotten wars.